The Movie show Matlab procesing of the experimental data obtained in a subsonic wind tunnel. The testing model is a wing with airfoil C-16, chord c = 707 mm, and sweep angle of 45°. The wing is placed horizontally in the facility test section. The oncoming-flow turbulence level is within 0.1%. The wall flow characteristics are determined through hot-wire measurements using single-wire and V-shaped probes, which are displaced in three directions by an automatic traversing system. At each measurement point, the recording of a signal of the hot-wire probe is synchronized with the generator of secondary oscillations. 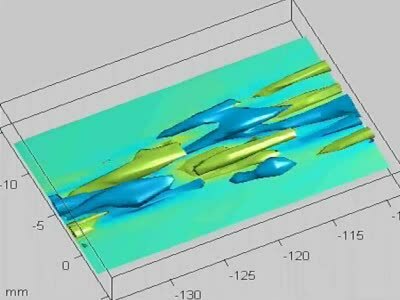 Read more in Instability of a swept-wing boundary layer modulated by stationary flow perturbations.